Grilled Italian Sausage and Peppers served in a bun and topped with marinara sauce, melted mozzarella cheese, and fresh basil. The perfect easy summer dinner! We grill out almost every night during the hot summer months. 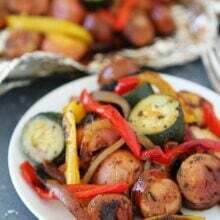 One of Josh’s favorite quick and easy summer meals are these Grilled Sausage and Peppers. He loves Italian sausage, especially on the grill. You certainly can serve the Italian sausage and peppers plain, but Josh doesn’t stop there. He goes all out! He serves the Italian sausages, peppers, and onions in a bun with marinara sauce, melted mozzarella cheese, and fresh basil. Whoa is right! These sausage sandwich rolls are legit! 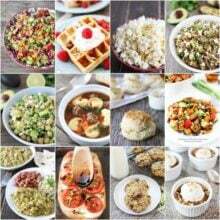 Don’t worry, this summer meal doesn’t take long, you can have it done in 30 minutes tops! You can buy Italian sausage links at almost every grocery store. Josh prefers spicy Italian sausage, but he always buys mild Italian sausage for the boys. Heat the grill to medium heat. If you don’t have an outdoor grill, you can use a grill pan and cook the Italian sausages inside. Place the sausages directly on the grill and grill for 5-7 minutes per side, or until cooked through. When the sausage is done cooking, transfer the sausage to a dish or plate and tent in foil to keep them warm. You could also place the sausages on a rack in your grill to keep them warm over indirect heat as the veggies cook. Grill sliced bell peppers and onions until they have a nice char, about 7-10 minutes. The grilled peppers and onions will give the Italian sausage great flavor. Spoon marinara sauce over the top. We like to use our Easy Marinara Sauce, but you can use your favorite store bought marinara sauce. Next, sprinkle shredded mozzarella cheese on top. To melt the cheese, you can place the assembled rolls on the grill and cook with indirect medium-high heat for a minute or two. You could also place the rolls under the broiler for 1-2 minutes. Just watch them closely under the broiler because they will heat up fast! Garnish the rolls with fresh basil and serve warm! 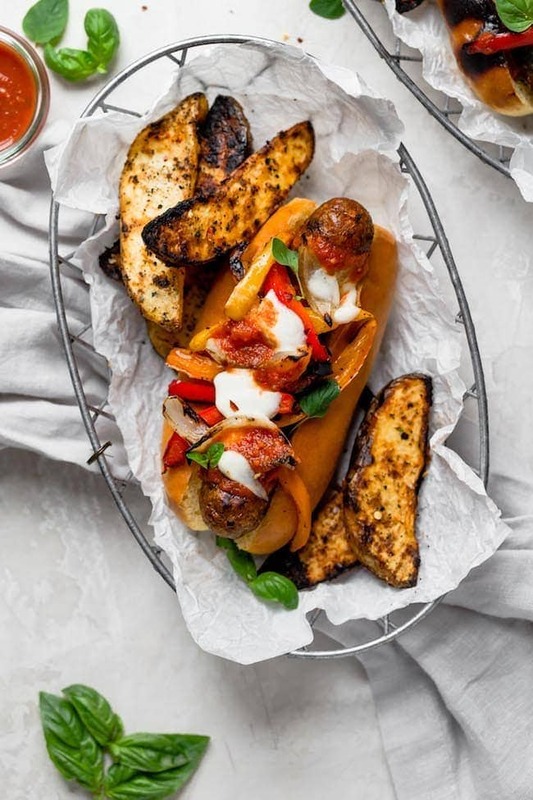 This Italian sausage recipe is a summer favorite! A sandwich with spicy, juicy Italian sausage, grilled peppers and onions, marinara sauce, lots of melty cheese, and fresh basil…made in 30 minutes. What’s not to love? 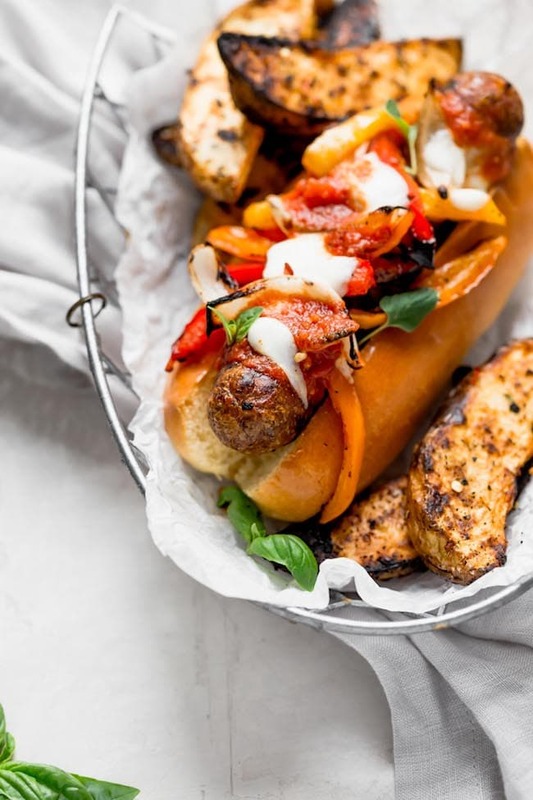 Get out your grill and enjoy Italian Sausage and Peppers for dinner tonight! Grilled Italian Sausage and Peppers served in a bun and topped with marinara sauce, melted mozzarella cheese, and fresh basil. The perfect meal for a BBQ or easy weeknight dinner. Prep the veggies: Place the sliced peppers & onions in a medium bowl, then toss with the olive oil and ½ teaspoon each salt & ground black pepper. Set aside. Grill the sausage: Place the sausages directly on the grill grates and grill for 5-7 minutes per side, or until cooked through. Once done cooking, transfer the sausage to a dish or plate and tent in foil to keep them warm. You could also place the sausages on a rack in your grill to keep them warm over indirect heat as the veggies cook. Grill the veggies: Meanwhile, as the sausage cooks, grill the veggies. Place the veggies in a grill basket over medium heat, and grill for 7-10 minutes, tossing them often, until they are softened and have a nice char. Assemble the rolls: Place a sausage in each bun or roll. 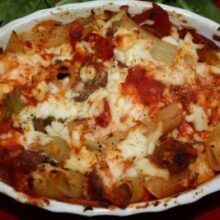 Top with the grilled peppers and onions, 2 tablespoons of the marinara sauce, and a sprinkling of mozzarella cheese. To melt the cheese, you can place the assembled rolls on the grill and cook with indirect medium-high heat for a minute or two. You could also place the rolls under the broiler for 1-2 minutes. Garnish with fresh basil, if desired and serve warm. OK, how have I never put marinara sauce on grilled sausages before! Brilliant! Can’t wait to try these. I bet everyone just loves them! A summer staple at our house!! Grilling season has arrived!!! 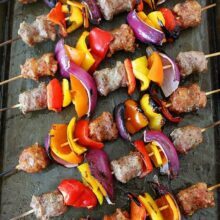 My hubby will love these – big into sausage and peppers!!! This is perfect for a summer grill-out with friends! So easy and sure to be a hit! I roasted the peppers and onions in the oven so I didn’t have to babysit them on the grill. I made this for my in laws for dinner and they loved it! We all did. I will make this one again! I also made a garlic butter and put that on the buns before assembling and broiled them in the oven, it added a nice base flavor. What are the potato looking things on the side there? And how did you get those so nice and crispy?